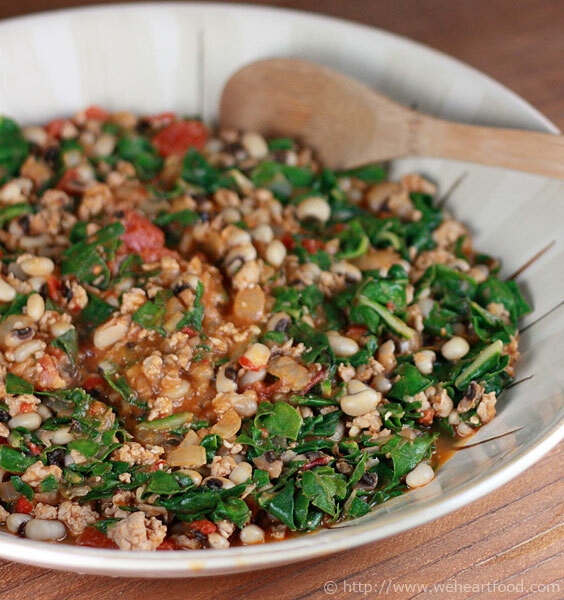 This stew is based on one made with ground lamb in Mediterranean Hot and Spicy . I don’t usually cook with black-eyed peas, and don’t think I’ve had many dishes where they were a main component — usually I’ve experienced them as a side dish. This stew was bursting with flavor and, according to Lisa, was even better the next day as delicious leftovers for lunch. Oh, I love the spices in this. The flavors are awesome. Yeah I really like all the different ways we’re finding to use the chard in our CSA box. I want to make this with lamb some time, but actually, it really works with the ground turkey. I think it’s great with the turkey — I just haven’t been in a lamby mood lately. Well don’t feel baa-aa-aa-aad; this is definitely one of those recipes that’ll enter the rotation. I only feel “baa-aa-aa-aad” for anyone reading this who had to put up with that pun. In a medium saucepan, cover the black-eyed peas with water by 2 inches, bring to a boil, and cook for 5 minutes. Drain, add fresh water just to cover the peas, and bring to a boil. Lower the heat, cover, and simmer for 15 minutes or until just tender. Drain once again. In a dutch oven over medium-high heat, heat the oil. Add the onion, salt to taste, and saute for four minutes until tender. Add the turkey and saute until firm and cooked through, about 8 minutes. Add the pepper paste and stir for 30 seconds. Add the tomatoes, red pepper flakes, black-eyed peas, and vegetable stock. Bring to a boil, reduce the heat, and simmer for 10 minutes, or until the peas are very tender. Add the chard and toss to wilt. If the dish is watery, increase the heat and stir until mostly evaporated. Adjust seasonings, and serve. 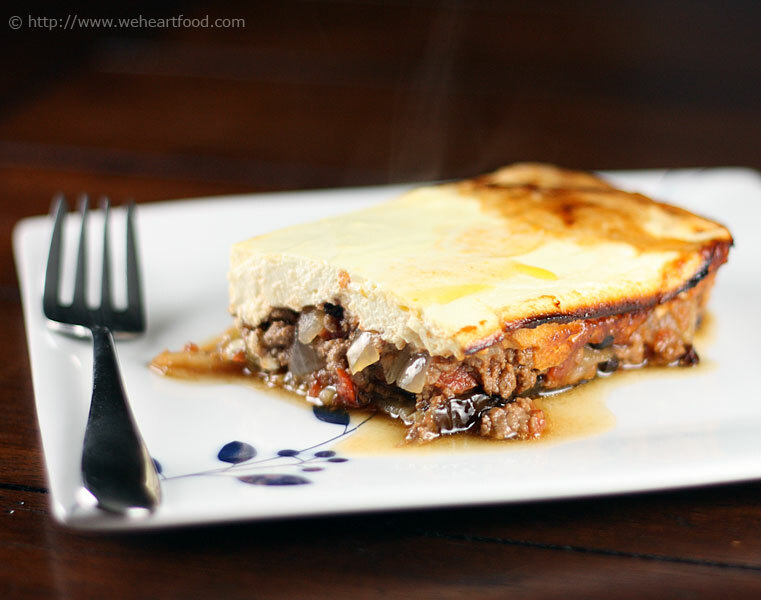 I’d been craving lamb, and Lisa was in a I-want-lasagna-but-we-just-had-lasagna mood, so moussaka seemed like the perfect bridge between our two wants. This recipe comes from the book Mediterranean Hot and Spicy ; the moussaka was certainly hot (after being in a 400F oven for an hour…) but spicy? Not so much. Mouth-watering? Yes. Mouth-burning? No. Just a warning; this is not a recipe you can just whip up when you get home from work; it’s a multi-hour commitment! I can’t believe you’re just finishing up, I would have been frustrated hours ago. Ha, I actually enjoy the occasional time-intensive recipe; besides, the last hour I haven’t been doing anything but getting hungry while I wait for it to finish baking. Well I’m glad it’s done now… I’m starvin’, Marvin. This smells awesome… Mmm.. and there’s the lamb I’ve been craving. Oooh, I love the texture of the baked yogurt top. And the meat is good — not super-duper “lamby”. All the veggies are great; I like the layer of green peppers. The potato layer is awesome. Whoa — looks like there’s a ton leftover. There is — you could totally cut this recipe in half and just bake it in an 8″x8″ pan and you’d be set for 4 servings. I guess at some point we’ll be able to report back on how this freezes and reheats. Indeed — we’ll have to whip this out midweek next week. It’ll be nice to not have to work nearly as hard for it next time. Salt the eggplant slices, place them in a colander, and let them drain for at least 30 minutes. Meanwhile, heat about an inch deep of olive oil in a deep, heavy skillet over medium-high heat and fry the potato slices until browned but not cooked through. Remove with a slotted spoon and layer on the bottom of a 9×12″ glass ovenproof casserole dish. In the same oil, saute the peppers over medium-high heat, stirring often, until they start to color, about 10 minutes. Remove with a slotted spoon and reserve. Reserve the oil, measure out 1/4 cup, and return it to the pan. Saute the lamb in the oil, stirring often, for about 10 minutes, until no longer red. Add the chopped onion and continue to saute for another 10 minutes, or until translucent. Add the cayenne and red wine. When boiling, add the currants and tomatoes. Lower and simmer for about 15 minutes. Season to taste with salt, pepper, and more cayenne if wanted. Add the nutmeg and allspice and add to the heat. Wipe the eggplant slices with paper towels and place them on a baking sheet. Brush both sides with the reserved oil and broil about 4 inches from the heat until golden brown on both sides. Arrange the eggplant over the potatoes, overlapping if necessary. Layer the peppers over the eggplant and top with the lamb/tomato mixture. In a bowl, mix the yogurt with the egg yolks, stirring well. Pour the mixture over the lamb/tomato mixture. Bake for 1 hour, until the top starts to color and the moussaka is bubbly.